Is Courtney Love Battling an Eating Disorder? 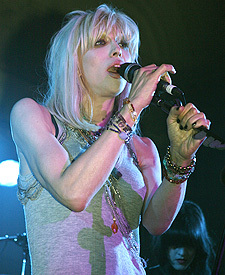 Courtney Love’s weight has dramatically plummeted, and her skinny new body is leading to whispers of an eating disorder. But Courtney, who dropped 52 pounds from her 180-pound frame in just a matter of months, says those rumors are false – and that she shed the weight by changing her diet to shakes, fish and veggies! The rocker has had a long, publicized battle with body image since gaining weight after leaving rehab last year. She said she tried the macrobiotic diet, popular with slim stars like Gwyneth Paltrow, which consists of eating only raw food. But the plan backfired for Courtney, and she said she actually gained weight! She said she just now starting to lose the pounds.